A major new initiative to promote priestly vocations is coming in early November to all 219 parishes of the Philadelphia Archdiocese. 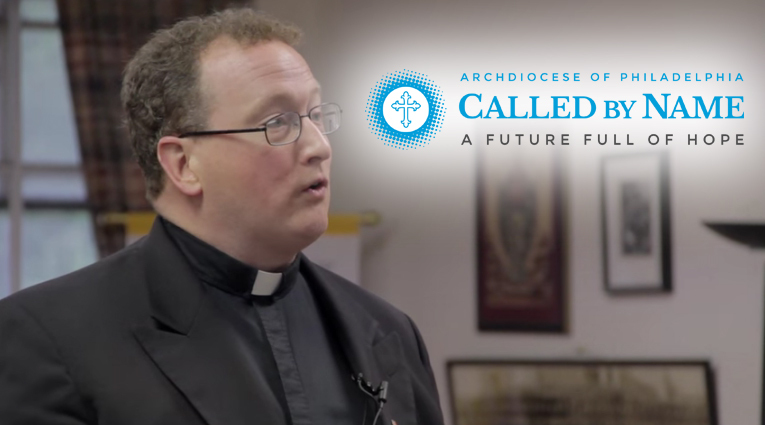 “Called by Name” aims to get parishioners involved by inviting them to write the name of a young man they believe has the qualities of a good priest on a card available at the end of church pews, and to place the cards in collection baskets. The names will be reviewed by each parish’s Vocation Review Committee and candidates personally invited to attend an upcoming discernment event. Vocation retreats in December, January and February are planned at St. Charles Borromeo Seminary as a follow up. The program will roll out during all Masses in the parishes on the two upcoming weekends of Oct. 31-Nov. 1 and Nov. 7-8. To encourage young men to consider the priesthood, a new film, “Heed the Call,” has also been released. It was produced by the Vocation Office for Diocesan Priesthood and directed by Bill Rose of Joyful Films (watch the video below). The “Called by Name” initiative was created to continue the momentum that started this year when the number of new Philadelphia seminarians increased three-fold. The program is modeled after similar successful efforts in the Albany and Brooklyn dioceses in New York. Archdiocesan vocations director Father Stephen DeLacy is hoping for a positive response. Speaking at a press conference in August announcing the program, he said he would be disappointed if there were not 200 young men open to exploring their vocation further. “I have full confidence that vocations are out there,” Father DeLacy said. “Called by Name” will not become an annual event but its planners hope the habit of personally inviting young people to consider a religious vocation will itself catch on among all Catholics in the archdiocese. See more information about the Vocations Office and St. Charles Borromeo Seminary at their websites. PREVIOUS: World Meeting was big, but was it the biggest event in Philadelphia history?